Here's another charming picture book from Walker Books (original 1988; my copy 2006). Can't You Sleep, Little Bear? was written by Martin Waddell and illustrated by Barbara Firth. After I read Owl Babies (and loved it! ), I looked out for more by UK author, Martin Waddell. This is the story of a little bear who just can't get to sleep. He's frightened of the dark. I know parents who will relate to Father Bear's efforts to settle his cub, and I believe kids will understand the problem and enjoy the resolution. It would make another fine story for bed time, like others I mentioned in Bed Time Goes Better with Books. It is perfect for under sixes. 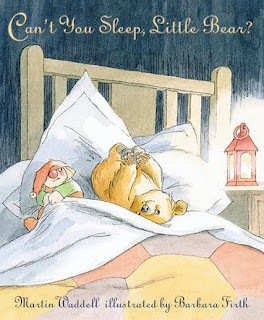 We over sixes can't help but chuckle at the antics of a wide-awake little bear. My copy is a Story Book and DVD. The DVD is remarkably true to the story. More particularly, it is true to Barbara Firth's illustrations, with minimal bells and whistles in animation. Narration is gently done by Kevin Whatley and Emilia Fox. If, like me, you think it's a great idea for kids to experience good literature in the format of printed books AND video, this would make an excellent choice for you. I like the idea of kids watching book-related movies. In my opinion, repeated viewings of a movie that is faithful to the text will help them learn to read the text. Memorising is a great help with predicting. Kids are going to spend time with screens, so I believe in making an effort to find them wholesome yet fun stories that do double duty where possible. In this case, it may lead a young watcher to becoming a young reader. What a magical outcome!